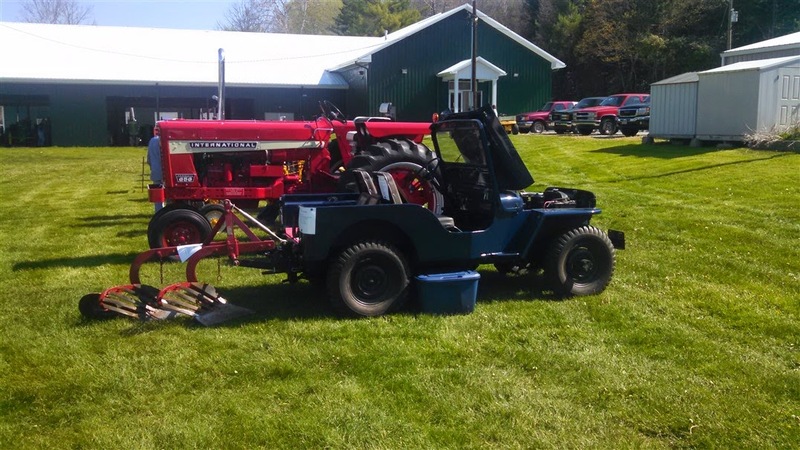 After a long winter we needed to get the 3a ready for the first spring antique machinery show here in central Indiana. Evan and Barry spent a day make the final adjustments to insure everything was working as it should. 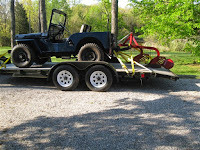 Part of the testing involved getting the jeep with the plow attached on the car hauler trailer. But first, Barry needed to re-install the PTO rear gearbox. He had taken some time during the winter to replace a leaking seal. The seal on the output had been leaking for the past year. Thanks to folks on the CJ3A Page (Installing and Rebuilding a Rear PTO Setup) and on the CJ2a forum, we found the correct seal and made the necessary repairs. Back in February, we reported on the installation of a brand new pump for the Newgren lift. While we were confident that the new pump/plow would work as expected, we hadn’t tried loading it on the car hauler we use for transporting the jeep to shows. The Newgren plow was designed to work with the Monroe lift. It has a “tall” mast rather that the “short” mast found on the early Newgren plows. So the clearance on bottom of the plow is less than would be found with a Monroe/Newgren combination. As the jeep is driven up the loading ramps of the trailer, the front of the jeep goes up and the rear goes down. The combined jeep with plow is around 16’ long. The good news is that we were able to load the jeep with the plow without major issues, the plow barely dragging as we drove the jeep onto the trailer. Or perhaps, the seal is the deal is a better description. At the end of show, as Barry was loading the jeep, he noticed that the plow wasn’t lifting as easily as it had. When he unloaded the jeep at home he saw a tale-tale sign on the deck of the trailer – a spray pattern made by a pump with a blown seal. Bummer! The new pump had a blown seal, the same issue we had with the old pump. We are sure the old pump was worn and needed to be replaced, but something isn’t right. Off to seek help from our friends at TractorByNet.com and the CJ2a forums. We even got the local Case/IH tractor dealership involved. 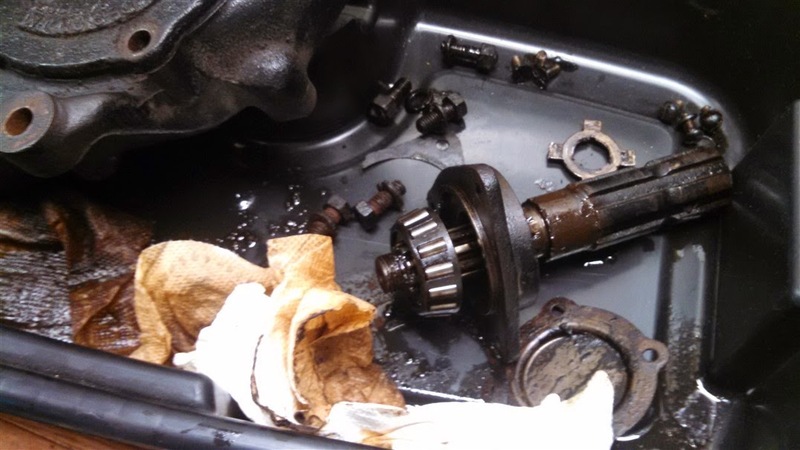 The conclusion was that the pump was blowing seals because of excessive pressure. Most modern hydraulic systems have built-in pressure relief systems, but Newgren doesn’t. The pump normally only builds pressure when it is pushing against the cylinder, for example while lifting the plow. Otherwise the pump is just circulating fluid in and out of the reservoir, referred to as being in the neutral position. But something was causing pump to continually build pressure, rather than returning to neutral after lifting the pump. This was evident when running the lift up and down with the reservoir filler cap removed. Under normal circumstances, nothing should happen with the filler cap removed, since, in the lift or neutral positions, the control valve doesn’t allow pressure to build in the reservoir. In our cause, fluid was being pushed out the filler tube – the reservoir was being pressurized. The problem had to be in the control valve. The Newgren control valve is very simple compared to modern control valves. Push one direction and fluid is directed to the cylinder. Let go of the control lever and the fluid just dumps into the reservoir (the neutral position). Push in the opposite direction and the fluid is released from the cylinder (allowing the implement to lower). Again, letting go of the control lever returns the system to neutral. Apparently something wasn’t allowing the system to return to neutral. That something was a small return spring located on top of the control valve. The lower return spring can be seen in this picture, taken from underneath the jeep bed. Using a small mirror, Barry was able to see that the upper spring had slipped out of its groove and was not providing enough spring action to return the lever to true neutral position. Luckily the fix didn’t involve removing the lift from the jeep. 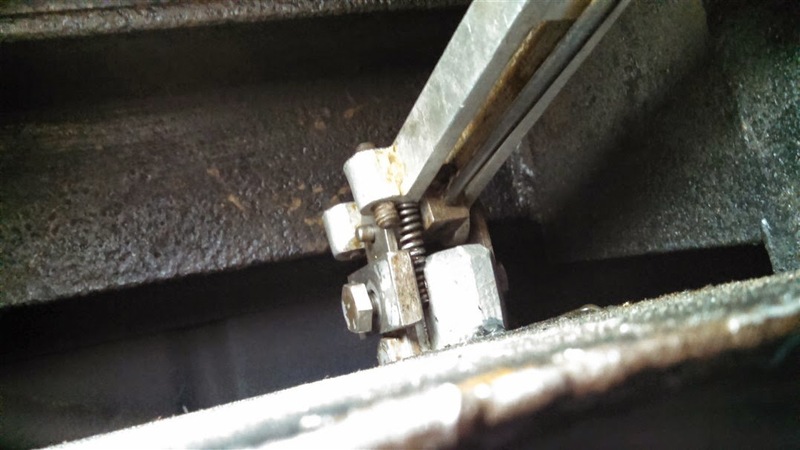 By removing two bolts, the bracket holding the springs in place comes off, allowing the springs to be re-positioned. Taking the bracket off took a minute. Working in the cramped space, getting the springs in the proper position and replacing the bracket took 45 minutes. Still a lot quicker and easier than removing the lift. A quick test with the leaking pump revealed that control was working correctly. No fluid was being pushed out of the reservoir with the control in any position. Problem easily solved. The mystery of how the spring got out of position remains. On a final note, this was the first show with the plow mounted on the jeep. It was a great success. With the plow on the back of the jeep, visitors immediately got the farm jeep concept. With just the lift, it took a lot more explanation. While it is more work to take plow, we think it is well worth the effort. Copyright © 2019 Barry & Evan Thomas. Jeep® is a registered trademark of Fiat Chrysler Automobiles. FarmJeep.com is an enthusiast’s site that is not affiliated with Fiat Chrysler Automobiles in any way.